Windows application to batch convert PDF to JPEG, it is good for both computer-savvy people and beginners. With the help of this tool, you can convert thousands of PDF documents to JPG files in batch. If you have a lot of PDF documents to convert into JPEG, there is hardly a better conversion utility in the whole world than this PDF to JPG Converter. PDF to JPG Converter has a number of options that will make your daily work into a pleasure ride. You can mark more than a thousand of PDF files for conversion and it will take just one click of a button on your part and a couple of seconds on the converter’s part to render them all in JPEG. To start working, lunch PDF to JPG Converter. 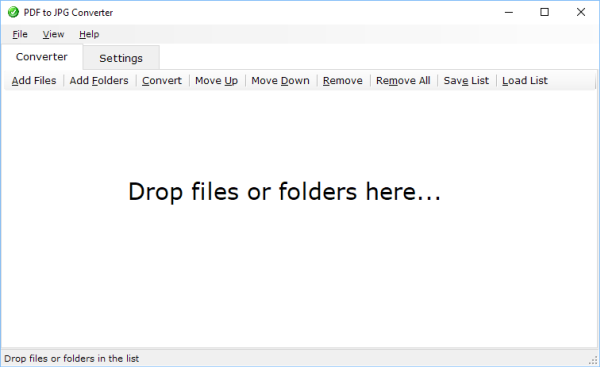 Select folders or files, drag and drop them in the conversion list. You can either leave the default options or make your own options. Once you are through with the options, click Convert button. If you are looking for the easy way of how to convert PDF to JPG, try PDF to JPG Converter – a user friendly windows program with advanced options that allow to batch convert PDF into JPG files in a way you want. In the options you can set the quality percent for the JPG file. You can also set the colour (high colour or grayscale jpg) and can set the resolution. It has a robust and user friendly interface, which makes it very easy for even a beginner to convert PDF to JPG. Batch conversion saves time and simplifies the procedure of converting PDF to JPG format. You don't have to pay any money before you actually make sure converter can convert your PDF to JPG. Download the free trial version and give it a try. Later you can register it entering the license key. PDF (Portable Document Format) is an open standard for document exchange. The file format created by Adobe Systems in 1993 is used for representing two-dimensional documents in a manner independent of the application software, hardware, and operating system. Each PDF file encapsulates a complete description of a fixed-layout 2D document that includes the text, fonts, images, and 2D vector graphics which compose the documents. Today, 3D drawings can be embedded in PDF documents with Acrobat 3D using U3D or PRC and various other data formats. In the majority of cases, the PDF format is well suited for the storage and exchange of electronic documents. However, there are certain tasks where PDF is either poorly suitable or not suitable at all. For example, you may have to convert PDF to JPG in order to insert them into a PowerPoint presentation or Microsoft Word document. The publication of documents on a site in the JPG format protects them from being altered due to the lack of fonts on the user's computer. The ease of work with a corporate archive increases if the list of links given by the search engine contains thumbnails of the first pages of found documents. JPEG (Joint Photographic Experts Group) is a commonly used method of lossy compression for digital photography (image). The degree of compression can be adjusted, allowing a selectable trade-off between storage size and image quality. JPEG typically achieves 10:1 compression with little perceptible loss in image quality. Supports batch PDF to JPG conversion. Convert each PDF page into a separate JPG file. Supports high colour and grayscale.